Preview: Day three of Season 6’s final leg serves up a tantalizing fixture, as Zone B’s current third-placed team Bengal Warriors face a visit from second-placed Patna Pirates in what is a crucial fixture for both teams. With a victory against the reigning champions, Bengal Warriors will see themselves climb up to second place in the Zone B standings with three additional games in hand. 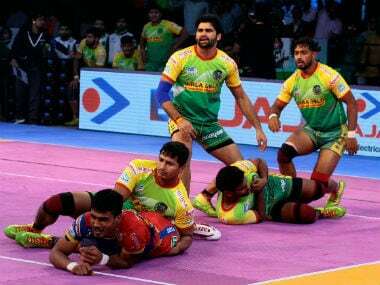 Defeat will leave Patna Pirates only five points ahead of Telugu Titans with each team having a game left in the campaign. The two teams last met in Mumbai where Patna Pirates’ offence fired as the team amassed 50 points and won by a 20-point margin. Bengal Warriors captain PO Surjeet Singh has managed seven tackle points in his last two outings at an outstanding strike rate of 70, indicating a return to form just in time for the business end of the campaign. With Bengal Warriors coming up against the league’s highest average scoring offence, Singh’s leadership, as well as his gameplay in the Right Cover position, will be a big factor in his team’s quest for a crucial victory over the reigning champion. With 56 tackle points, Patna Pirates’ second-year player Jaideep is yet again leading the team in defence this campaign. The Left Corner will be up against one of the league’s best raiders in Maninder Singh and, Jaideep’s duel against the Bengal Warriors ace will be the key to Patna Pirates’ victory. Jaideep has managed two High 5s in his two appearances against Bengal Warriors this campaign and will be aiming to make it a hattrick on Saturday.